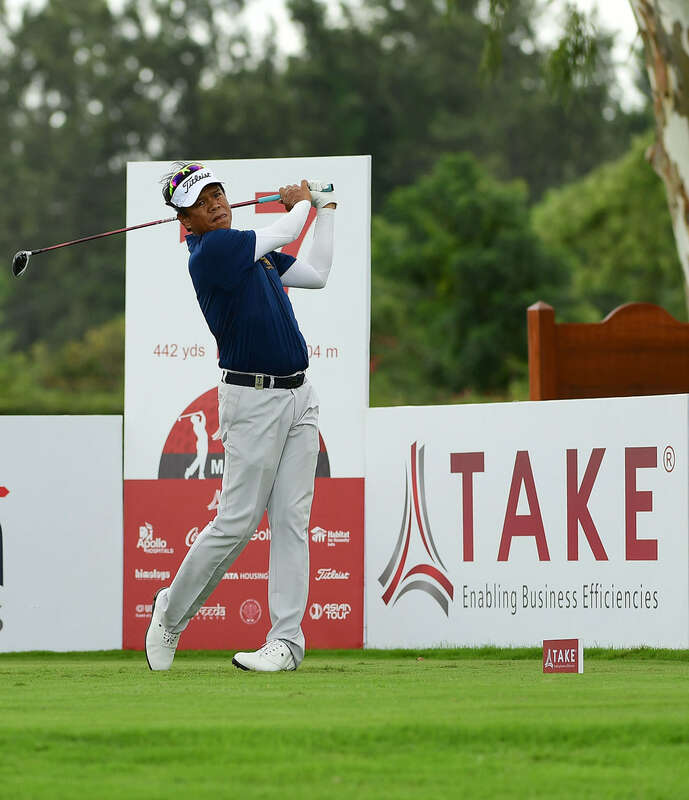 Bengaluru, August 9: Thammanoon Sriroj, one of the senior most players on the Asian Tour, turned the clock back with a stunning 9-under 62 at the Par-71 KGA golf course to grab a handy four-shot lead on the first day at the TAKE Solutions Masters on Thursday. The four-shot lead is the largest any player has held at the end of the first round at any event this year on Asian Tour. Making good use of the soft conditions and preferred lies ruling, he got his distances to perfection and landed the approaches with unerring accuracy to card a brilliant round of 62. Young Indian, Feroz Singh Garewal, who shares the same coach as Shubhankar Sharma, who plays in the PGA Championship this week, shot 5-under 66 to share the second place with Thai duo Danthai Boonma and Suradit Yongcharoenchai, Zimbabwean Scott Vincent and Argentine Miguel Carballo. Local lad and last year’s runner-up Khalin Joshi, who as an amateur shot a 10-under card when the course was played as Par-72 in 2012, was among the bunch of seven in Tied-7th at 4-under 67. Another Indian in that group was Om Prakash Chouhan, while others were Sri Lankan Anura Rohana, who has won an Indian Tour event at this course, Australians Jake McLeod, Maverick Antcliff and Thais, Arnond Vongvanij and Settee Parkongvech. Asian Games-bound amateur Aadil Bedi carded 3-under 68 to be Tied-14th and Harimohan Singh, also going to the Asian Games later this month, shot 2-under 69 to be Tied-24th. The third Asiad-bound amateur, Rayhan Thomas had a disappointing day with 3-over 74. Other good scores from prominent names included six-time Asian Tour winner, SSP Chawrasia, who bounced back from 2-over to 2-under with four birdies on his back nine, M Dharma (3-under 68), S Chikkarangappa (2-under 69), Jyoti Randhawa (1under 70) but Jeev Milkha Singh returned 1-over 72. Garewal, who played at the last Asian Games in 2014, and was fifth at the Youth Olympics the same year, shot five-under-par 66 to set the early pace at the morning wave. Sharing the second place with him was 22-year-old Danthai, who made his Major debut at The Open last month. Danthai returned a flawless round highlighted by five birdies while Garewal, 21, carded six birdies against a bogey. Sriroj, who is just 10 months away from his 50th birthday, and is waiting to get into Japan’s Senior (Over 50) Tour next year, won the last of five Asian Tour titles in 2004 at the Tianjin TEDA Open in China. Since then his only success outside Thailand’s domestic tour has been at the 2015 Taiwan Championship on the Asian Development Tour. Between 2004 and 2008, he played mostly in Japan, but never won there. After losing his card in Japan, Thammanoon returned to Asian Tour in 2008, but lost his card in Asia in 2014. Since then he has played on the second rung tour, the ADT. This year after numerous attempts to get back his job on the Asian Tour, he finished T-11 at the Q-School finals to get his card. Before this week, he made the cut in five of the eight starts with T-11 at Bangladesh Open being his best. Thammanoon had a blazing start with five straight birdies after teeing off from the tenth and then a sixth one on Par-5 18th, which was his ninth hole. He turned in six-under and then added three more birdies on first, third and sixth to get to a whopping 9-under and the record for the lowest round in an Asian Tour event at the KGA was under threat. He finally made a mistake on seventh with a bogey on seventh, but soon got that back with a birdie on eighth. This morning the players wore a Black ribbon for former Asian Tour player, Jarrod Lyle, who passed away after succumbing to cancer earlier today in Australia.